How to add Google Analytics code to your WordPress website... in 30 seconds! There are two ways you can add the code to your WordPress site, manually and with a plugin. You can add the tracking code by simply pasting it into your header.php file. To do this, log into your WordPress dashboard, then navigate to Appearances and select the Editor menu option. Once you’re on the Editor page, find your header.php file in the menu on the right hand side. If you’re having some trouble, try searching for it by holding down CTRL and F then type in header.php. Once you’ve found the file, select it to open the page. Now scroll down (or search using control + f) to the </head>. You want to paste the tracking code from your Google Analytics account just above this tag. Now scroll down a little more and select the blue Update File button. You’re all done! 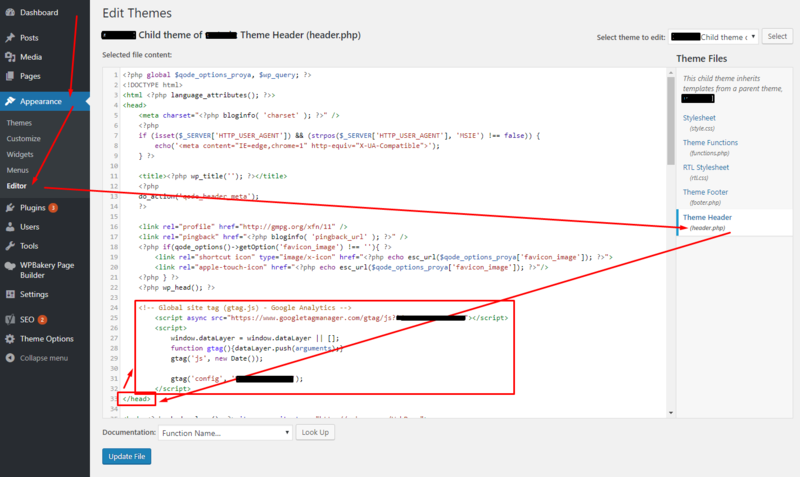 How to add Google Analytic’s Tracking Code to your website using a WordPress Plugin. Note: This method should only be used if you don’t have access to your Editor page. For example, sometimes Brisbane WordPress developers will limit their client’s access to areas of their WordPress website to keep them on a tight leash. This means the developers have full control over how you can edit your website. If this is the case, be sure to request full administrator rights and then give that Brisbane WordPress developer the flick! Once you’ve logged into your WordPress dashboard, navigate to Plugins and select Add New. Type into the search box, Smart Google Code Insert. You can also download the plugin from here https://wordpress.org/support/plugin/smart-google-code-inserter/reviews and upload it. Once you’ve completed the Install and have Activated the plugin, go to Settings in the left hand menu and find Smart Google Code. Now, simply paste your tracking code into the Google Analytics text box and scroll down to select the blue Save Changes button! And again, that’s it! Time to track your analytics and make some money! Well that’s about it. If you are having some trouble finding your Google Analytics Tracking Code, then this comprehensiveness guide should help. Alternatively, you can watch the video below for a quick run through! And, of course, if you’re a Brisbane local and would like to have a chat with our friendly web design team about getting the most out of your WordPress website, then please don’t hesitate to get in touch! We work with Brisbane clients from all kinds of industries to help their businesses grow. Feel free to give our glowing reviews a quick read to see for yourself!